CURLEY GRIFFIN is chiefly revered by rock 'n' roll collectors for his role in the creation of Dixie Fried and Boppin' The Blues. Curley wasn't content to sit in the background, though; he wanted to be on Bandstand, too. Born Malcolm Howard Griffin on June 6, 1918, he was partially sighted and attended a school for the blind. He was on WDXI in Jackson, Tennessee when he met Carl Perkins. According to Perkins, Curley came up with the idea for both Dixie Fried and Boppin' The Blues, but Curley's claim-to-fame really ends there. He recorded several self-produced singles for Atomic Records. Got Rockin' On My Mind, features Curley's son, Ron, on lead guitar, and it has clear allusions to Dixie Fried. A tape was sent to Sun because Sun's publishing company, Hi-Lo, handled the publishing. As can be deduced, Curley really wasn't much of a vocalist, although he made up in enthusiasm what he lacked in finesse. According to Perkins, Curley died in 1964 or 1965. 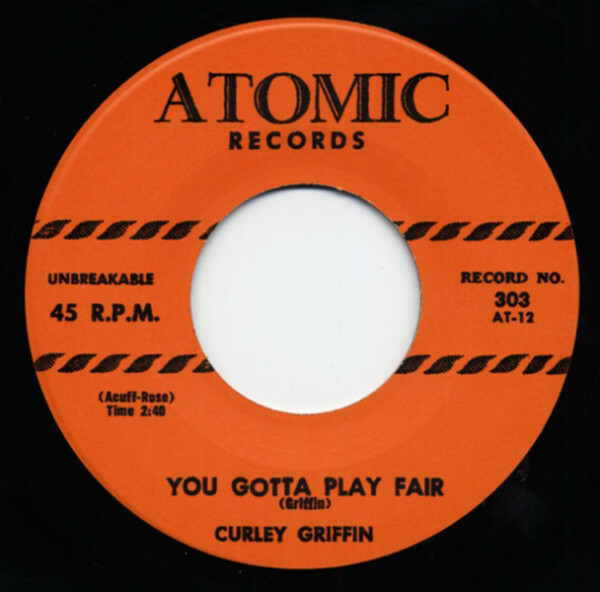 Customer evaluation for "You Gotta Play Fair - I've Seen It All 7inch, 45rpm"